A set back has cost US footwear company Five Fingers, creators of the running shoe that claimed to have health benefits. Over 70 million pairs were sold of the strange looking “barefoot” running shoes that are said to mimic the experience of barefoot running, and according to the company “improve foot health”. The law suit was filed back in 2012 when the complainant believed that Vibram deployed deceptive marketing and falsely advertised the benefits from wearing its shoe including; strengthening the muscles in the feet and lower legs, improved range of motion in the ankles, feet and toes and stimulating neural function important to balance and agility. However, experts have found that the shoe may actually have negative impacts on foot health. “Barefoot running has been touted as improving strength and balance, while promoting a more natural running style,” claims the American Podiatric Medicine Association. “However, risks of barefoot running include a lack of protection, which may lead to injuries such as puncture wounds, and increased stress on the lower extremities.” Partial refund of the shoes is available to consumers (up to US$50 of the RRP of US$100). Vibram is also banned from making future claims about the health benefits of its shoes. 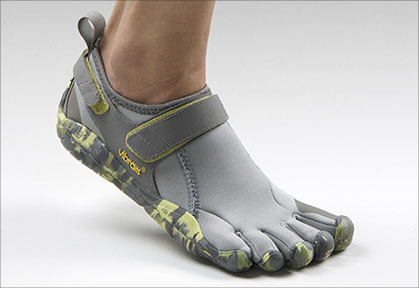 “Vibram will not make any claims that Five Fingers footwear are effective in strengthening muscles or preventing injury unless that representation is true, non-misleading and is supported by competent and reliable scientific evidence” according to the Federal Court.